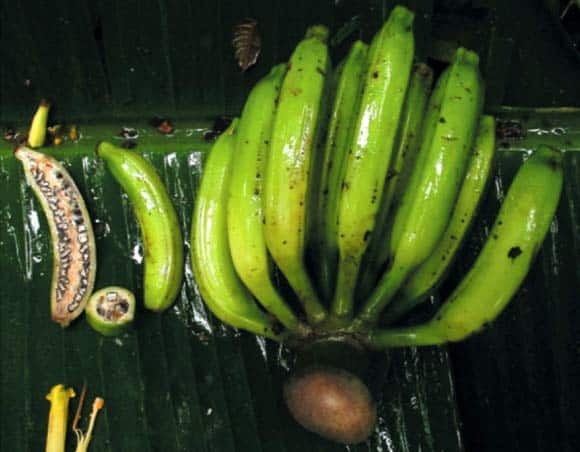 Researchers have discovered a new species of banana christened “nanensis”, belonging to the Musa genus, sharing a place in the family Musaceae with more than 70 other species of bananas and plantains. Its scientific name honors the province of Nan where the type specimens were collected. A – clump of pseudostems; B – leaf bases; C – cross-section of petiole canal; D – male inflorescence; E – female inflorescence; F – male flowers, tepals fused at base and six anthers fused at base; G – female flower, tepals fused at base and six sterile anthers or five sterile with one fertile anther fused at base; H – transverse and longitudinal sections of fruits and a hand. Here’s a fun fact: every banana you’ve ever eaten — most likely a Cavendish — is genetically identical to all other bananas. Why? Wild bananas contain big, hard seeds and very little flesh, making them almost inedible. Since its domestication over 7000 years ago, farmers have been hard at work selectively breeding the fruit to have really tiny, non-fertile seeds. Tasty, but not very practical — the lack of seeds means that growers must rely on “pups,” cuttings of an existent banana plant, to propagate crops. So basically, each one of the long yellow fruit you’ve purchased in a shop or grocery is thus genetically identical to all other bananas in the building. One of the biggest concerns with having a whole species of clone organisms is that because they are genetically identical, they could all be wiped out by a single disease. Such was the case with the Cavendish’s predecessor, the Gros Michel, that was wiped out by the fungus fusarium oxysporum. Wild species of banana, however, do have seeds. The random combinations of maternal and paternal genes that sexual reproduction creates helps species adapt to pathogens. Should our banana crops ever suffer from an event as terrible as the Panama disease again, their wild relatives might be our only chance to save the banana split as we know it today. According to Dr Sasivimon Swangpol of Mahidol University and her colleagues, Musa nanensis is a perennial herb, 4.9 to 9.8 feet (1.5 to 3 m) in height. Its flowering time is year round, and its fruits are 2.8 inches (7 cm) long and 0.6 inches (1.5 cm) wide, straight to curved, angular with prominent ridges at maturity. Each bunch has 3-10 hands and each hand contains 4-10 bananas. Seeds are irregular, sharp angular, 3-5 mm by 2-5 mm by 2-3 mm. The fruits and hands of Musa nanensis. 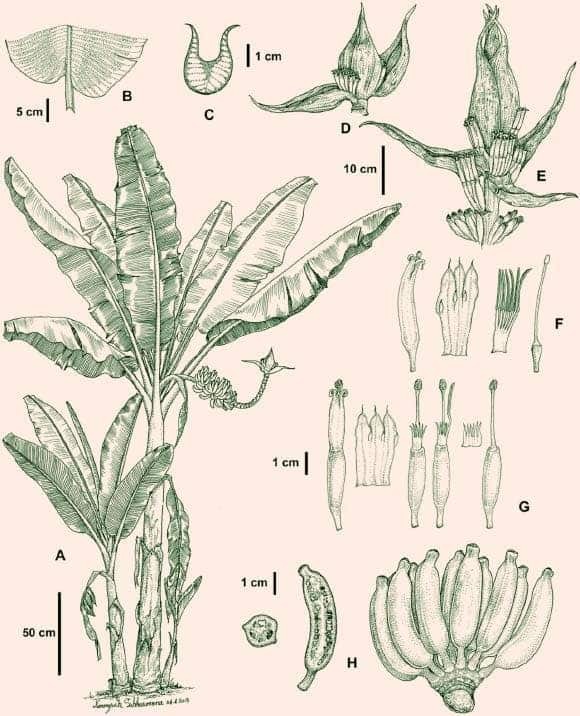 “The new taxon possesses generally thicker leaves than other Musa species,” Dr Swangpol and co-authors wrote in a paper in the journal Systematic Botany. Several specimens of Musa nanensis were collected from only one locality close to the Thai-Lao border in the province of Nan. However, it is expected that the new species will be found across the border in Laos PDR. “The taxon was found at 2,740 feet (835 m) altitude in the dry evergreen forest, by streams in a valley in a lower mountainous forest,” the scientists said. According to the team, Musa nanensis is an extremely rare plant. “Since the first collection in 2002 until 2012, it has been seen by the authors only at the type locality, where there are fewer than 50 plants,” Dr Swangpol and her colleagues wrote in the paper.